It took two players to send Jon Lester’s pickoff move into premature retirement. Lester threw to first twice before making his first pitch to Jose Bautista, who was batting behind Davis. Then Lester pitched out. “Nothing doing,” Don Orsillo said on the NESN feed, completing the broadcaster’s traditional call-and-response. With a 1-0 count, Lester threw over again. On 1-1, Davis broke for second, but Bautista popped out, bringing up Davis’s accomplice in the pickoff-move murder: Edwin Encarnacion. 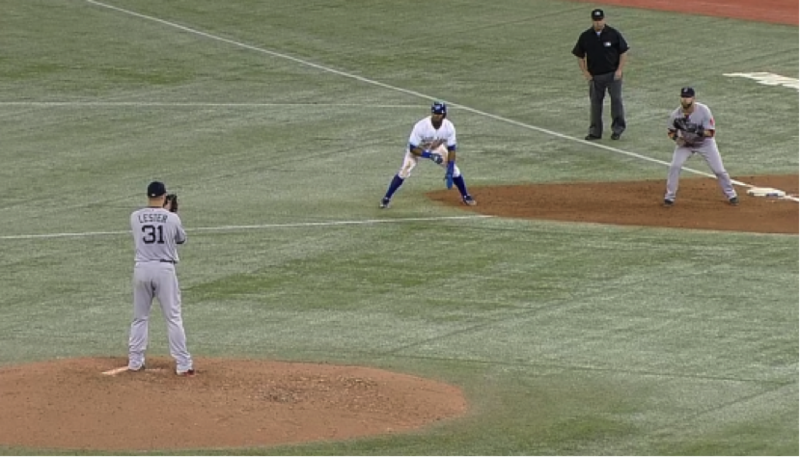 Before issuing his first pitch to Encarnacion, Lester tossed to first for the fourth time in the inning. Like the previous pickoff attempts, it was weaksauce, a sinking lob that first baseman Mike Napoli had to crouch to catch. That fourth throw in Davis’s direction, we now know, was Lester’s Last Pickoff, at least for a long while: He hasn’t attempted a pickoff, halfhearted or otherwise, in the 66 starts he’s made since then, postseason included. Lester’s pickoff aversion came to the Internet’s attention shortly before last September’s AL wild-card game between Oakland and Kansas City, when author Jon Roegele tweeted it to the masses. Hours later, Kansas City cemented those already astonishing stats in our minds. Three Royals stole second off Lester, and all three subsequently scored. Lester didn’t deserve all the blame — Kansas City stole four more bases after Lester exited — but in a back-and-forth beginning to an unpredictable postseason, the ease with which the Royals exploited Lester’s idiosyncrasy seemed like the one outcome that anyone (Lester included) could have anticipated. That whiff of fait accompli is what made Lester’s Opening Day performance for the Cubs, who signed him to a six-year, $155 million deal in December, so disturbing. Facing St. Louis, Lester again declined to throw over. Cardinals runners — who without offseason acquisition Jason Heyward attempted the fifth-fewest steals of any team last season — attempted four against Lester, succeeding three times,1 and went first to third on singles in three of four chances. After 65 consecutive pickoff-free starts, it was, on one level, unsurprising that Lester would extend his streak to 66. On another level, though, it seemed like an ominous sign: If the widespread exposure of Lester’s flaw last September — followed by a winter’s worth of reflection and a spring-training intervention by his new team — couldn’t conquer his reluctance, then maybe it can’t be conquered. Also ominous: Lester did attempt a pickoff in a minor league game on March 31, ESPNChicago’s Jesse Rogers told me via email, but he bounced it in front of first. In the aftermath of Lester’s first start, some Cubs fans might be wondering whether his pickoff quirk could be his undoing. “Either he figures out his issues and does something about it, or he tries to throw to first and can’t do it,” wrote Scott Wuerz of the Belleville News-Democrat, in an article that questions whether the Cubs’ marquee offseason acquisition is damaged goods. “At that point, it’s going to be a base running free-for-all.” So should the Cubs be calling backsies on their biggest contract, or has the oddity of Lester’s pickoff behavior blown its significance out of proportion? That question would be easier to answer if we knew why Lester’s pickoff count has cratered. It’s too simple to say that, at some point between Encarnacion’s swing and the resulting fly ball’s bounce off the upper deck in Rogers Centre, Lester developed taste aversion to pickoffs and couldn’t think about throwing one without suffering flashbacks to Encarnacion’s bomb; if that were the case, the Cubs could cure the condition by having Lester throw pickoffs repeatedly, accompanied by soothing sounds and massage. But while April 30 was the day Lester’s pickoff move died, it had been wasting away for a while. By then, broadcasters were already aware of Lester’s struggles: After the third pickoff attempt in the lefty’s fateful fifth inning against Toronto in 2013, NESN’s Jerry Remy said, “Right now, these are just show-me pickoffs by Jon Lester. He does not have a good pickoff move. He doesn’t like to throw to first base.” Just four years before that, a young Lester had been celebrated for his pickoff prowess. But by the spring of 2012, Lester’s pickoff move was a project, a small-scale Steve Blass disease that caused him discomfort but never metastasized. By the time broadcasters start talking about something of strategic importance, it’s usually not news to teams. In the starting-pitcher section of every advance report filed before an upcoming series, there’s a field for the scout to rate each pitcher’s skill at checking the runner and throwing to first. Some of these forms automatically populate with pickoff-attempt totals. Moreover, most teams’ internal video systems allow players and team personnel to queue up throws to first and watch them in succession. It’s a stretch to suggest that teams weren’t aware of Lester’s missing move until Roegele’s September tweets. But let’s say, for the sake of the thought experiment, that the advance scouts were slacking or slow on the uptake — that while they knew Lester was having problems with pickoffs, they didn’t realize he’d stopped throwing over entirely. And let’s say that hitters were either ignoring the advance reports or reluctant to depend on them, conditioned by past experience to fear pickoffs from southpaws, who have clear lines of sight to runners on first and more deceptive moves than righties. It makes sense that there would be some lag time between the first team uncovering Lester’s vulnerability and the rest of the league exploiting it, which would explain why runners haven’t grown more daring against Lester as his pickoff-attempt totals have dwindled. Still, however well Lester’s lefty mystique has worked in the past, it’s possible to imagine the situation spiraling out of control now that his secret is national news and baserunners can smell blood in the water. So let’s assume that Lester’s former competence at controlling the running game doesn’t guarantee future results. Let’s also assume that no matter how strongly the situation demands a pickoff attempt — even an underhand soft toss for appearances’ sake — Lester won’t give in to the temptation. And finally, let’s assume that runners will show no compunction about taking advantage of Lester’s pickoff hangup. With all of those conditions satisfied, how much worse would Lester be? Would his baserunning reckoning be barely a blip, a career-ending train wreck, or the always popular Option C, “something in between”? Answering this question requires computer numbers. As Joe Morgan once incoherently complained about Moneyball, “I could make that computer say what I wanted it to say, if I put the right things in there.” In this case, that’s the idea. If you’ve only played mainstream, big-budget releases, you probably don’t think of sports games as close approximations of reality — “video-game numbers” is a phrase for a reason. But there’s a breed of baseball game that makes up in mathematical modeling what it lacks in realistic looks: the simulator. After Lester’s outing on Sunday, I reached out to representatives from five of the longest-established and best-respected baseball sims: Baseball Mogul, Diamond Mind Baseball, Dynasty League Baseball, Out of the Park Baseball, and Strat-O-Matic Baseball. These games can get addictive — my college roommate, who played more than one, is still wondering what happened to the second semester of sophomore year — but they’re also deeply customizable and statistically rigorous enough to double as testing grounds for scenarios as far-fetched as Lester’s actual life. With each of these programs, we can simulate a season (or seasons) in which Lester has the least control over the running game that the software’s settings permit.3 In Baseball Mogul, for instance, each pitcher has a “Pickoff Move” rating and a separate “Holding Runners” rating. Zero out the default skill settings and you get a Lester who’ll never throw over and baserunners who are well aware that he won’t. In Out of the Park, pitchers have a “hold rating” on a 20-point scale. Lester received the minimum one point. Dynasty has a “Pickoff” number, a “Hold Frequency” grade, and a “Hold Success” score. Virtual Lester got a 1, an F, and a +4, respectively, the worst possible assessment in each area. In Strat, pitchers have a triple-tiered “Pickoff Rating.” We gave Lester the lowest. Then we compared the simmed full-season performance of the edited Lester in each game to his simmed full-season performance with default settings intact. Here are the results, with Diamond Mind excluded. All of the above results were based on either single sim-seasons or slightly larger (but still small) sim-season samples, which means they’re subject to large fluctuations. Dynasty reran Lester’s 2014 in Boston and Oakland with his new (lack of) skills, while the other three games projected his 2015 performance in Chicago. Each sim started with a different understanding of the offensive environment and Lester’s true talent, so the “Altered” stats for each game should be compared only to the “Unaltered” stats from the same title. Although the magnitudes vary, there are a couple constants: Altered Lester always allows many more steals and significantly more runs, though not enough runs to totally derail his season. For more reliable results, we’d have to run many more sims to quiet the statistical noise. Fortunately, we can do that with Diamond Mind, which was developed almost three decades ago by sabermetric pioneer Tom Tippett, who began consulting for the Red Sox in 2003, joined the team full time in 2009, and continues to serve as an informal adviser to the company that curates and updates his old software (probably because the Diamond Mind 2014 Red Sox usually win way more than 71 games). If you were hoping for “Breaking Madden”–style insanity, you’re probably disappointed: While we tweaked Lester’s skill set significantly, we didn’t turn every opposing runner into Tim Raines or make every Cubs catcher Mike Piazza. Neither alternate Lester was so helpless that runners routinely stole second, third, and home while he held the ball. Even so, the effects were significant. Both alternate 2014 Lesters allowed more than an additional half a run per nine innings than the real Lester did last year, with the more steal-prone, poor–Hold Rating Lester finishing slightly worse. For simulated Lester, zero pickoff attempts is a permanent way of life. For real-life Lester, it doesn’t have to be. His next start comes on Monday; if nothing else, he’s given the Cubs a second impossibly long streak that their fans can’t wait to see snapped. Thanks to Bloomberg Sports, Russell Carleton, Sean Forman, and the League of Extraordinary Simulators for research assistance. This post originally stated that Jon Lester’s next start would come on Sunday; due to a rain delay earlier this week, it is instead scheduled to come on Monday. Thanks in part to an off-target throw by David Ross on Kolten Wong’s fourth-inning steal of second. On Wednesday, Cubs GM Jed Hoyer suggested that Lester survives by varying the time he takes between pitches. According to data from Baseball Prospectus, Lester ranked eighth in time-between-pitch variation among qualified starters last season — but only with the bases empty. With men on — in other words, when it mattered — he ranked 97th. We’ll leave his catchers’ arms — which wield less influence over the running game — alone. And some of them would have scored whether they had stolen a base or not.